Oh the shark has, pretty teeth dear, and he shows them, pearly white... When I found this grey fabric, I simply had to make a shark toy. Not only is it a fun shape for a toy, Sharkie (Baby Shark, Sharkle Fang...) has been Humphrey's nickname since his nibbley puppy days and a shark toy would be just perfect for our wild beasts. Shark attack! I experiment with many materials for toys, but the toughest fabric I've used thus far is the green upholstery fabric as toys like Frankenstein and the infamous Snakey Snake - which is still in play even now! The heavy upholstery fabric has a bonded black fleecy backing - thick work for sewing but it is really great for tough stuff! Unfortunately, it's not easy to find and when I do, the colour options are rather limited. That's why I was stoked to come across it in grey at my local shop. And I new EXACTLY what I was going to make first! To make your own shark toy, you will need pre-shrunk/washed sturdy fabric, mixed fleece scraps for embellishments (a great use for offcuts! ), complementary coloured thread, stuffing, squeakers (optional), and scissors/sewing tools. 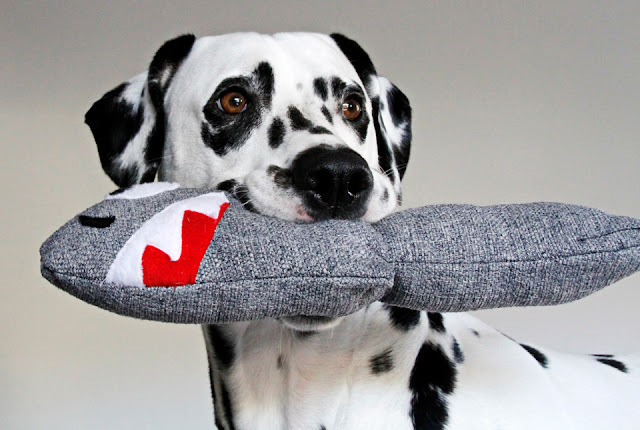 Softie dog toys follow the same basic principles as you would use if sewing (or buying) for a small child - no loose parts to nibble free and everything securely stitched into a sturdy toy. Cut two identical pieces of shark shaped sturdy base fabric (don't forget to include seam allowances). You can shape and scale your toy to best suit your fabric and your pet. I free-handed my outline for best-fit to the fabric, but there are tons of free shark/fish graphics that you can download and use as a template if you prefer. Cut scraps of fleece for eyes, mouth, teeth, and (optional) gills or other embellishments. I initially cut two rows of teeth, but decided just to use the uppers. It was a little too toothy for my liking (although realistically shark-ish) as I liked having more of the red mouth visible. Sew the eyes, mouth, and other embellishment pieces securely to the base of your shark. Fold (or layer) your shark at the tail so that it is right/embellished side in. Pin to secure. Sew together along the seam allowances, leaving an opening gap for inversing and stuffing. Sew to securely stitch closed the gap. Depending on your thickness and preferences, you can sew some additional external seams for style and/or strength along the tail and/or fins if you wish.